Fragments of a bowl with brightly painted tulips and flowers from Whitehall Slip. Archaeologists study a section of Whitehall Slip’s pier. Image from South Ferry Terminal Project Report 2012. 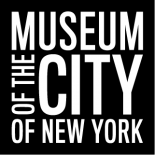 The Archaeology Project Team at the Museum of the City of New York recently finished digitizing the artifacts from Whitehall Slip in partnership with the Landmarks Preservation Commission. These objects are housed at at the New York City Archaeological Repository, and will soon be available online via a searchable database featuring vivid digital images of these artifacts and others. Detail of “Plan of the City of New York from an Actual Survey” by Francis Maerschalck (1755). Whitehall Slip is indicated by the yellow arrow. Image from South Ferry Terminal Project Report 2012. The discovery of Whitehall Slip was one of the most exciting finds made by a team of New York City archaeologists during the renovation of South Ferry subway station in 2005. Built in the early 1730s, Whitehall Slip was one of the biggest and busiest of Manhattan’s historical slips. Slips were a fundamental part of maritime travel and trade to and from New York. These man-made inlets were built where streets met the water’s edge and provided a space between two piers where ships could dock. The piers of Whitehall Slip formed a watery extension of Whitehall Street near the colonial Battery. The goods unloaded from ships at Whitehall supplied New Yorker’s with the necessities and luxuries of life in the old city. 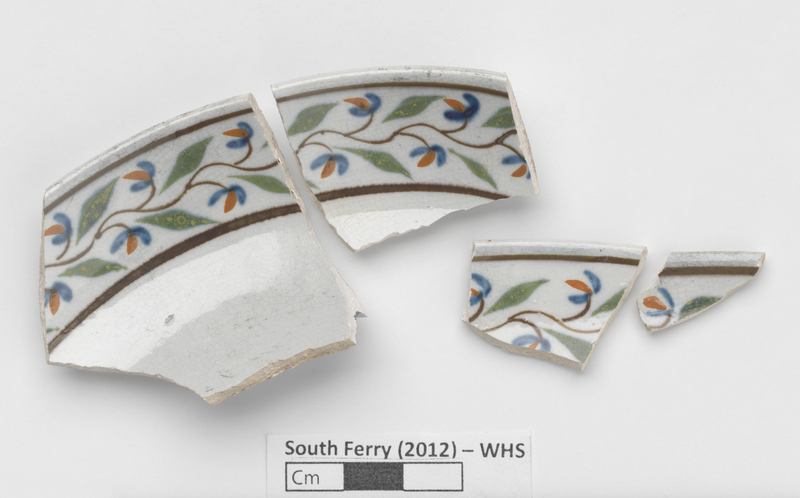 A group of nearly 1,000 fragments of broken pottery found by archaeologists at Whitehall Slip, shown in the images below, gives us a wonderful sense of the teaware and tableware that was imported from England to New York during the late 18th and early 19th century. Most of the fragments are pearlware, a type of refined earthenware made mostly in Staffordshire, England, from about 1775 to 1830. 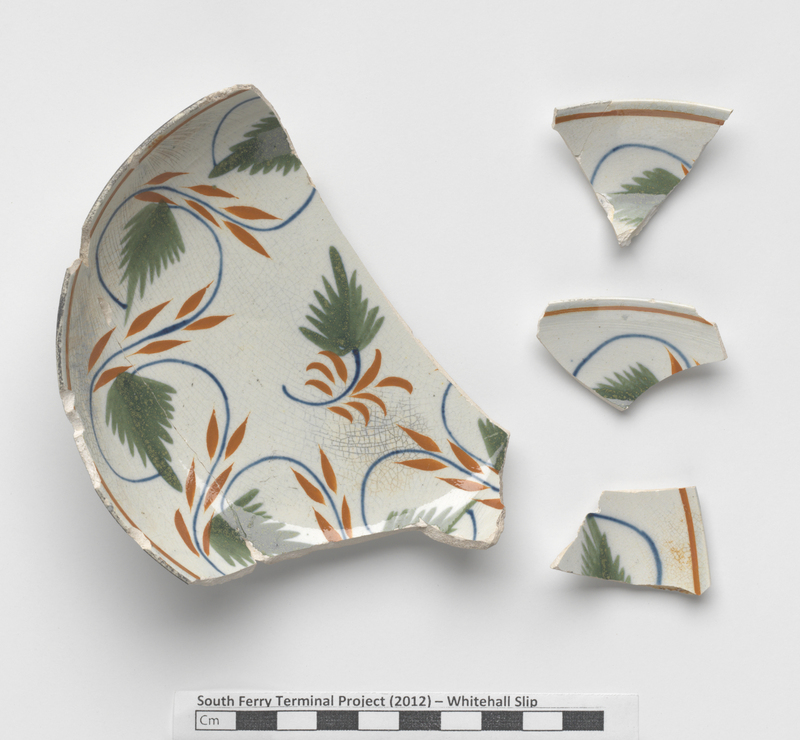 A group of objects excavated from Whitehall Slip that includes many fragments of fashionable pottery made in England during the late 18th and early 19th century. A group of objects excavated from Whitehall Slip that includes many fragments of fashionable pottery made in England during the late 18th to early 19th century. Fragments of a bowl with brightly painted tulips and other flowers from Whitehall Slip. Archaeologists were able to determine that these objects were never used for eating or drinking because the fragments they found did not have any scratch marks from spoons, forks, or knives. Archaeologists also believe that these cups, dishes, and bowls may have broken during the voyage across the Atlantic or while they were being unloaded at the dock. Because this damaged pottery would have no longer been usable, it was disposed of by dumping it into Whitehall Slip. Fragments of a beautifully painted saucer from Whitehall Slip. Fragments of delicately painted saucers from Whitehall Slip. As part of the landfill and debris that accumulated in Whitehall Slip, this fascinating group of artifacts also reveals how New Yorkers used slips to reclaim land along Manhattan’s shore. Over the course of the 18th and early 19th century, the land at the end of Whitehall Street was reclaimed from the sea by filling in Whitehall Slip with soil and trash, such as the broken pottery that was discovered by archaeologists. As the slip was gradually filled-in, its piers were extended further into the water so boats could continue to dock there. Detail of “Sanitary and topographical map of the City and Island of New York” by Egbert L. Viele (1865) showing how decades of land reclamation changed the outline of Manhattan Island from the 17th century (green) to the 1860s (pink). Manhattan’s footprint is even bigger today! Image courtesy of the New York Public Library. By repeating this process of filling-in and extending the slip, more land could be created along the shoreline for homes, warehouses, and other development. You can learn more about these discoveries by following this link to the South Ferry Terminal Project official report prepared by lead authors Diane Dallal (AKRF, Inc.), Meta Janowitz (URS Corporation), and Linda Stone. 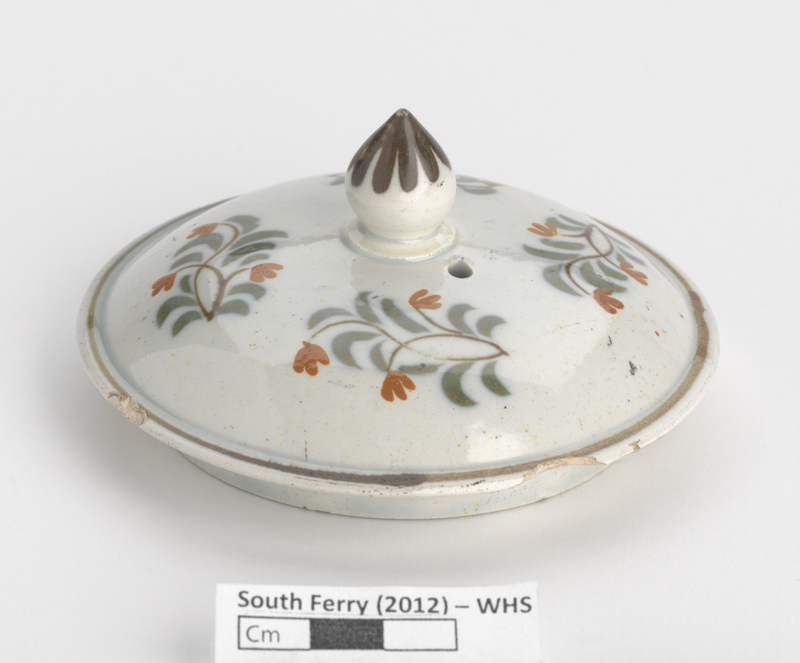 A painted teapot lid from Whitehall Slip. Fragments of a brightly painted saucer from Whitehall Slip. Research inquiries may be directed to archaeology@lpc.nyc.gov. 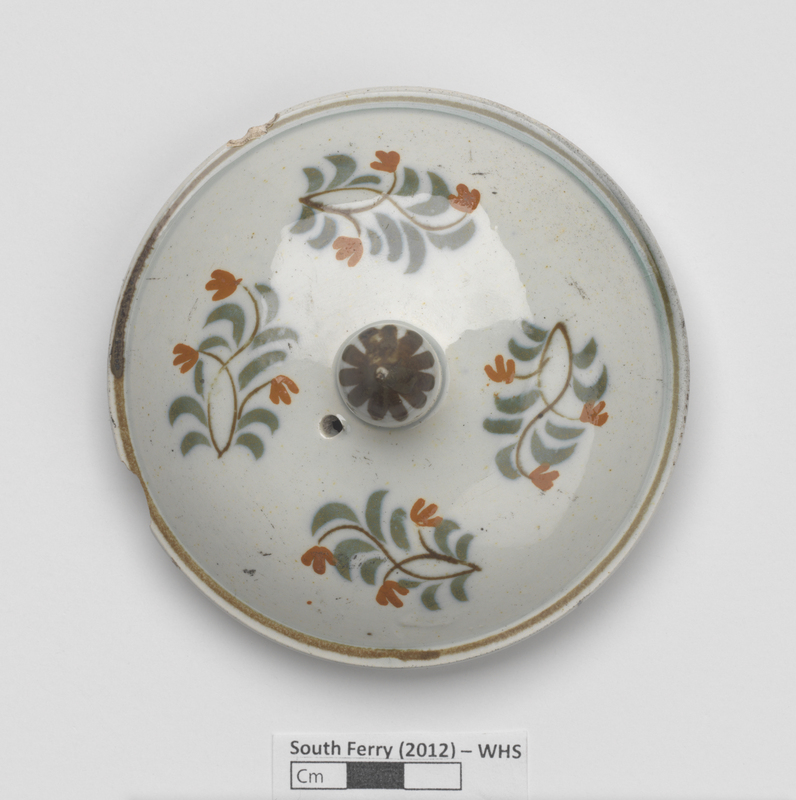 This entry was posted on April 30, 2016 by Sarah Kautz in Archaeology project and tagged 1700s, 1800s, archaeology, Artifacts, Battery Park, Cargo, Colonial New York, Decorative Arts, Landmarks Preservation Commission, Lower Manhattan, New York Harbor, Shipping, Slips, Whitehall.